You are here: Home / Family / Where have we been??? I would love to tell you that I had some fantastic reason why I have been absent from here, but that just wouldn’t be true. We have had a busy summer, working in the garden, hosting family and friends, but my latest distractions was little ones not feeling well. 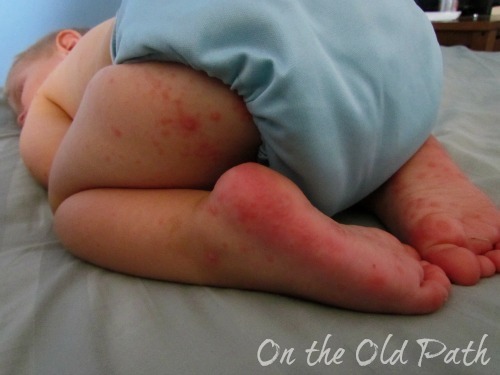 My children started with cold symptoms, and then ran a low-grade fever. Next the spots came. 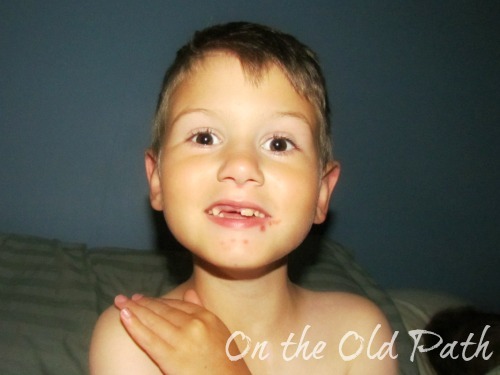 Samuel was the first to start with it and he had it the worst and was quite miserable for a few days. 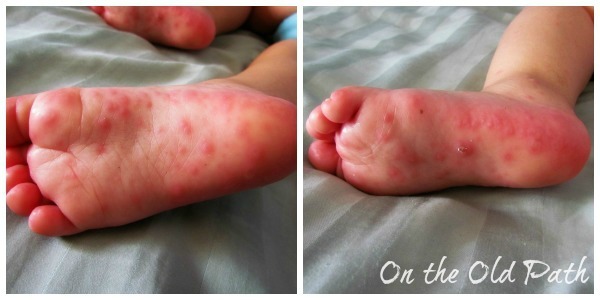 Samuel had them the worst around his mouth, hands, feet, diaper area, and then it spread up the legs and up the arms. He had a few small ones on his eye lid and ears and just one or two tiny ones on his back and tummy. Nothing on the scalp. Poor little guys feet got so bad he could hardly walk. I shook my head, “No I can’t think of anywhere he could have been exposed to poison ivy.” I mentioned that his face around his mouth was bad so he pulled out his soother. 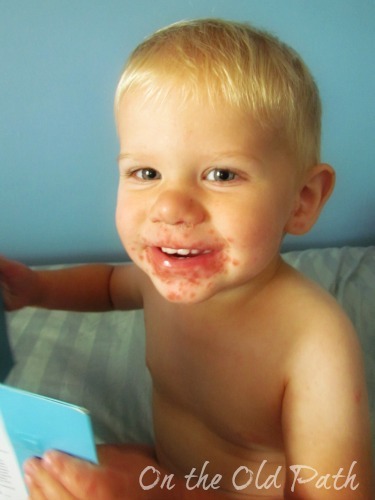 “That’s an infection, he has a skin infection! He is going to need antibiotics to clear that up.” I asked if it was contagious. “No it is a bacterial infection of some sort but he isn’t contagious.” Hating to put him on a med I took the prescription and headed home. Only to arrive home and find Joel with a very few spots, but nonetheless spots. Hmm seems contagious, Joel had just finished with the fever and Hannah was starting with one. I decided to take all 3 children back the next day as clearly something was catchy. As you can see Joel was a much milder case, and Hannah ended up having even fewer than Joel. I felt more confused than ever. I guess I wanted him to say hand foot and mouth disease because that is what made the most sense to me. No more spots appeared, none of the children ended up with any spots on their torsos. If it was the chicken pox it was the strangest case I have ever seen. 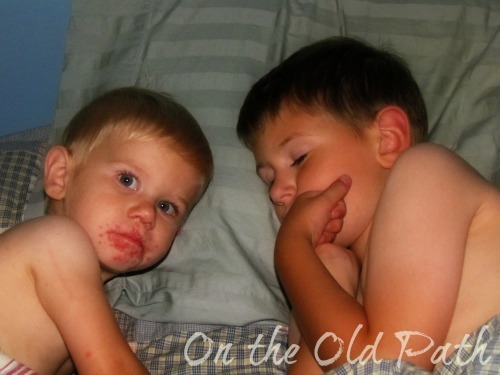 Most of Samuel’s spots did scab over, but Hannah and Joel’s spots just faded away. 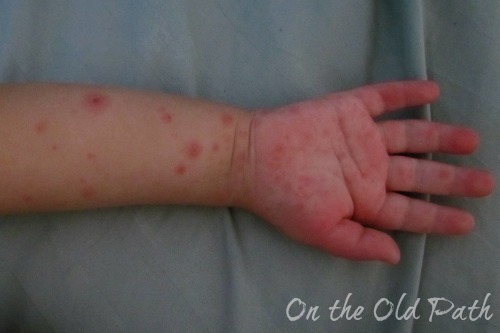 So what do you think chicken pox, hand foot and Mouth disease, or did they have two different things?? I’d love to hear your opinions.